The states of the Pacific Northwest display some of the most spectacular geology to be seen anywhere. Four massive mountain systems formed by hundreds of millions of years of compression along the Cascadia Subduction Zone show more than a billion years of Earth history with fragments of crust that have been carried there from around the world. 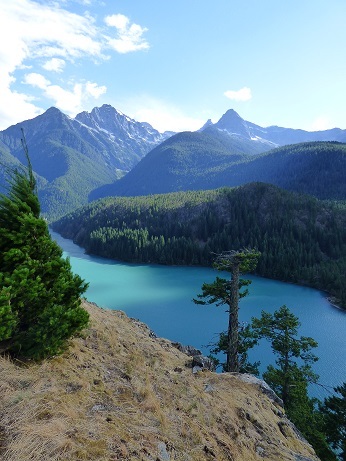 Destinations include Olympic and North Cascades National Parks, and a series of Cascades volcanoes, including Mt. Baker, Glacier Peak, Mt. Garibaldi, and the Black Tusk. We will also explore Vancouver Island, Puget Sound and the Salish Sea, the Sea to Sky Highway, and numerous cultural and archaeological sites across the region. The geological landscape sets the stage for human use and interaction. This region was one pathway for human settlement of the Americas from Asia, and those people diverged into multiple cultures that thrived on the natural resources such as fish. A diversity of cultures lives in the region today, and we will experience evidence of past lifeways as well as how people live today in the region. The trip will take place on June 26-July 10, 2019. Geology 192 and Anthropology 192 are both 3-unit courses that will be taught concurrently for a total of six units.The total cost is $1,600 plus MJC tuition of $46 per unit. The trip will begin in Seattle, Washington (students must make their own arrangements to get to Seattle) and the participants will travel in rental vans and staying in hotels for the duration of the trip. The MJC Geology Club will be doing fundraisers this year to help alleviate the cost for students. Check out the Geology Club Facebook page for more information. There will be an informational meeting on Tuesday, March 19 at 5:00 PM in CAT 201 on the East Campus of MJC. Contact Garry Hayes at 209-575-6294 or e-mail.